If you’re watching season two of The Marvelous Mrs. Maisel, keep an eye out for these two dummies! Thanks for having me, Matt and Fergus! We just premiered Tole To! Wayang Aneh (Look! Strange Puppets), our newest show, here at Bulfest. It was a big step forward for The Brothers Campur. The show was massive, emotional, exciting, and challenging - with 24 people speaking four languages - a true collaborative effort. (A Brothers Campur Plus show, as we joked.) It was epic, and not without some debate here in Buleleng. People were calling in on the radio to weigh in on whether a foreigner could be a Dalang - will they speak English? Balinese? Bahasa Kawi? I get it - It's strange! And even though I worked everyday on my performance chops, it might not have been enough - at least for some. I'm a much better puppeteer than when I first performed at the Bali Arts Festival in 2012, but a Dalang is much more than a puppeteer, just as this show is more than a traditional wayang kulit performance. What's old in America is modern here, and what's old here is modern back home, so the saying goes, and so our show has a little bit of a lot of things. Electric guitar accompanied traditional gamelan. Actors interrupted puppeteers, dalang swapped out mid-show, and a giant screen unfurled at the end for an epic final fight scene. We did it all and I’m just so grateful to all who helped make it happen. Until next time, my brothers! The Brothers Čampur got a visit from the Bali Post the other day. It was great talking with the reporters about our work, our history, and our upcoming show. I’ve been in Bali since late-June, working on new shows with my company, The Brothers Čampur! We took a break from the upcoming premiere of our next work to join our friend Sembroli in an amazing production of Lijah Lijah at the Bali Arts Festival! Thank you, Sembroli, for inviting me to collaborate on the work and for introducing me to so many amazing new friends and artists - as well as pioneering a new style of theater, Wayang Bondres! The video below features a short clip from my first scene as King Prabhu Awang-Awang. Enjoy! The Newts are here in upstate New York for the first ever New York State Puppet Festival! Catch up on all the festival action with this segment on WBFO, the local NPR station! In just a few days, the first full-length sharing of my most ambitious show will premiere at the Object Movement Festival. Untold Stories From The War With The Newts is an serious, farcical allegory about self-interest, set in an alternate version of the 1930s. Inspired by a classic Czech novel, the show brings together live music, high drama, expert slapstick, Czech marionettes, Balinese-inspired wayang kulit, and “junk” found in the wake of human destruction - all to ask: is the downfall of civilization unavoidably linked to human progress? Back in January, I spent a week in Ohio working on a video for The James hospital, conceived to help kids understand what to may happen if one of their parents is diagnosed with cancer. Here are a few behind-the-scenes shots from the shoot! The whole video can be watched here. Many thanks to SpaceJunk Media for bringing me onto the project! We're heading into the last week of Up and Away, an immersive production designed specifically for young audiences on the autism spectrum, here at Lincoln Center Education, as part of the first ever Big Umbrella Festival. With puppets, live music, and a on-going, interactive adventure into the clouds, this show has been a most magical experience. Many thanks to Trusty Sidekick Theater Company for bringing me onboard! 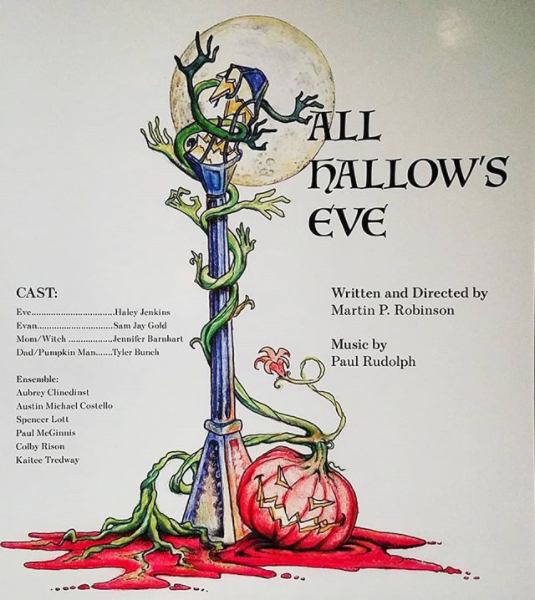 Tonight, after two weeks of non-stop work at the O'Neill Theater Center, we premiered All Hallows Eve, a new show by Martin P. Robinson (Little Shop Of Horrors), with original music by the incomparable Paul Rudolph. So elated, so exhausted, so proud of this show and the work everyone's put into it. Keep an eye out for this one! Up and Away, coming to Lincoln Center this Spring! I'm thrilled to be joining Trusty Sidekick Theatre Company's remount of Up and Away this spring! Catch me as Finn Fogg, as we take a hot air balloon ride up into the sky in April and May at Lincoln Center as part of the Big Umbrella Festival. Hope to see you there! I got to experience my first CO/LAB end of semester show this past weekend and it was a real treat. Our class devised a story inspired by the Nature Channel about a Giraffe with a lot of questions. We've been working on our puppetry technique and ensemble theater skills since early September and it's so thrilling to see the fruits of our labor on stage. Above you can see a 10 foot tall giraffe alongside a to-scale monkey puppet. I designed and built both, along with 3 birds, a handful of shadow puppets, and a sea of sharks for a commercial we made earlier in the semester for Sharkolate Ship Ice Cream. Can't wait for next semester's work! Last Spring, I gave myself a challenge to regularly write single location scenes without any puppets. Of all the scripts, my favorite was arbitratr, a semi-absurd/sadly-plausible story of a guy who uses a new start-up that's like UBER for your arbitration needs to break up with his girlfriend. I assembled a few friends to shoot the thing, and now you can catch its premiere at the Crown Heights Film Festival! All the info can be found here. And if you can't make it in person, you can also check it out online! The Brothers Campur Rides Again! It's so good to be back on the road with my pal Ian Coss and our Bali buds, Reka and Panji. We'll be spending the next three weeks bringing traditional Balinese Wayang Kulit to students, families, and audiences up and down the Northeast. Here's a cross-post from our first show! Hello from the Czech Republic! I have spent June living Prague, conducting research on a new theater piece with puppets inspired by a classic Czech novel, Karel Čapek's The War With The Newts. The month has felt incredibly fruitful for both the script and the show's developing aesthetic, and included making this guy, the show's first newt, a hand-carved, wooden marionette, made in the traditional Czech style. And the good news keeps coming! My show, Untold Stories From The War War With The Newts has just been awarded a 9 month residency at the Center at West Park, with a full length sharing set for next Spring in the Object Movement Festival. More the come as the show comes together over the coming months! I'm so excited to share that I've joined CO/LAB Theater Group as a teaching artist. CO/LAB (Creative Opportunities without Limits And Boundaries) is a non-profit organization that has been providing individuals with developmental disabilities a creative and social outlet through theater arts since 2011. It's a real honor to join these talented folks - I'll be working with my friend and CO/LAB co-founder, Arielle Lever, to pilot a puppet curriculum for the 2017/2018 season. Over the past nine months, I've had the pleasure of working with Off The Page Education to present the first theatrical adaptation of the powerful novel, All American Boys, by Jason Reynolds and Brendan Kiely. The show was devised and performed by an aged-appropriate cast, featuring a fantastically honest, brave, and talented cohort of teenage performers. After a premiere run last summer, the show was featured last week at WNYC's Greene Space. Below you'll find a livestream of our afternoon show, which was followed by a fantastic conversation between the book's authors and Rebecca Carroll, host of How I Got Over. We came, we stretched, we danced, we soared, we WON!! So happy to share one of my greatest artistic (and life) accomplishments of all time — WINNING DANCIFY THAT! Many thanks to all who came out to experience our ecstatic energy for men.